Just the other day we showed you a picture of the upcoming and unannounced Samsung Galaxy Ace 3. 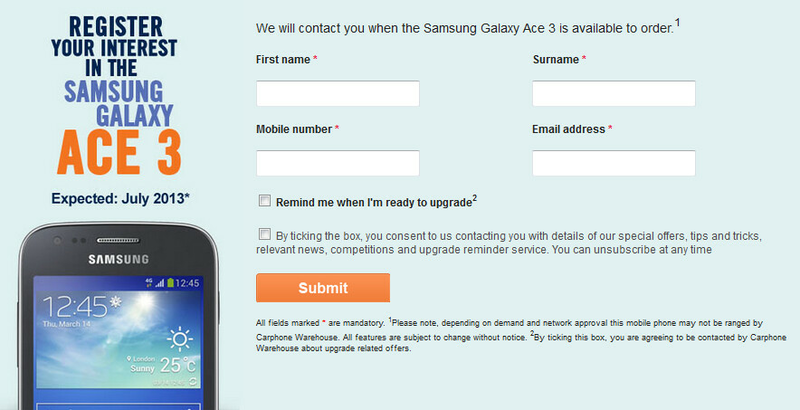 Well, the handset remains unannounced, but thanks to U.K retailer Carphone Warehouse's pre-registration page for the device, we see that the Samsung Galaxy Ace 3 is "expected July 2013". The pre-registration page allows those interested in the device to leave their email address, so that Carphone Warehouse can alert them when the phone is ready to be offered. The U.K.retailer is the only one in the region to confirm that it will be offering the Samsung Galaxy Ace 3. 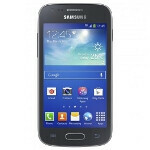 Despite its low-end specs, the phone will come to market with Android 4.2.2 installed and is the first of Samsung's Galaxy Ace models to offer 4G LTE connectivity. Will the Samsung Galaxy Ace 3 be making an appearance at Samsung's June 20th Premiere event? Considering that the Korean manufacturer appears to be throwing everything but the kitchen sink into this event, we'd wager that the device will make it there by hook or by crook. "I see you have a new Samsung phone. Is that the new Galaxy Ess?" "No, this is the new Galaxy Ace." "Oh. But it's not a Galaxy S."
LOL true I had that confusing conversation when I told someone I'm gonna replace my Galaxy S3 for a Galaxy Ace 3. This is the Galaxy S4 mini!